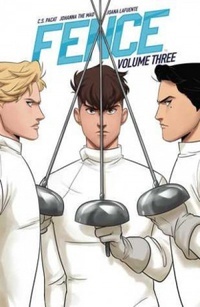 Scrappy fencer Nicholas Cox comes to the end of his path to prove himself worthy of a father he never knew in the face of surly upperclassmen, nearly impossible odds, and the talent of his rival, sullen fencing prodigy, Seiji Katayama. Sparks fly white-hot on the pitch as Nicholas and Seiji finally face off once again in the halls of King’s Row. It’s a match that will change King’s Row (and both of them!) forever, and set the stage as the team journeys to face their bitter rivals and prove themselves once and for all. The third volume of the breakneck series from writer C.S. Pacat (The Captive Prince) and fan-favorite artist Johanna the Mad comes at you as fast as a parry and hits as hard as a strike.